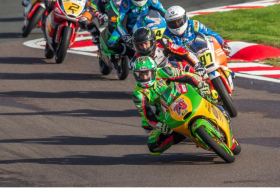 FPW Racing had a difficult weekend at Oulton Park Race Circuit but Storm Stacey pulled through to take another couple of 3rd place finishes but unfortunately this wasn’t enough and allowed Jake Archer to secure the 2018 Hel Performance Moto star championship and Jack Scott closed his gap in the points to Storms 2nd place in the championship to just 11 points!! The weather at Oulton Park was extremely changeable all weekend and luck was not on our side, Storm had an unfortunate crash in FP1 in end FP2 in 3rd position, with both sessions taking place in wet conditions. At the beginning of Race 1 the rain again started to lightly fall, as the riders where on slicks race direction made the wise decision to red flag the race to allow a restart on wet tyres if the rider preferred. In the 10 min delay, it rained again, brightened up then rained again, the Team took the decision to run rain tyres and full wet suspension setting as that’s what the weather suggested on pit lane, however a mile away on the other side of the circuit the track had started to dry up. Storm got another good start but his 9th place qualifying meant he could not quite get away with Jack Scott, Dan Jones and Brandon Pasche on the first lap. But Storm never gave up and pulled through with Jake Archer eventually catching and passing Pasche to take another 3rd place and moving himself for a 5th place start position for Sundays race. Storm is still currently 2nd in the Championship with 278 points – But Jake Archer has taken the Hel Performance Motostar Championship for 2018. Jack Scott is currently 11 points behind in 3rd which should make for some exciting racing at the last round at Brands Hatch.